Do you burn more calories when you think hard? 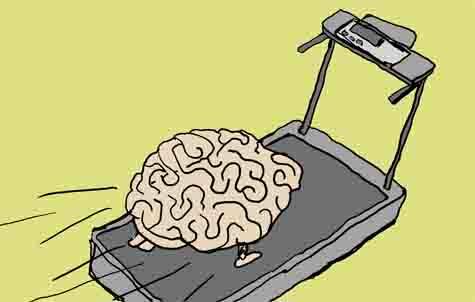 Although thinking hard often feels like a workout, you don’t actually burn more calories like you do when you break a sweat. But you might feel hungrier anyway, according to a study published in the September issue of Psychosomatic Medicine. Researchers from Canada’s Université Laval found that strenuous mental activities, such as concentrating on an exam, may lead people to consume more calories than they burn during the task. Subjects completed one of three assignments of varying difficulty—relaxing, reading a text and completing an intense task on a computer—then ate a buffet lunch. Although the groups burned around the same amount of energy, students who performed the strenuous mental tasks, particularly the one on the computer, consumed significantly more calories than those who relaxed. The researchers hypothesized that this discrepancy could lead to weight gain. “Computer-related activities represent a sedentary activity that is stressful and biologically demanding,” says Dr. Jean-Philippe Chaput, a lead author on the study. The students who had just finished the harder intellectual tasks ate around 200 more calories than did subjects who relaxed. This heartier appetite may be due to the increase of glucose levels in the blood that occurs after completing the arduous assignments, but not after relaxing. Brain processes such as thinking are fueled by glucose, a simple sugar found in food. Prolonged thought requires more insulin, which may explain why completing the hardest task made subjects hungrier. Chaput and his team proposed that this dependence on glucose causes deep concentration to boost energy intake, since the brain quickly burns glucose stores and needs replenishment from food. “Variations in glucose [in the bloodstream] may trigger episodes of hunger and higher food intake” in order to re-establish the balance of glucose in the bloodstream and keep it from rapidly increasing and decreasing, says Chaput. Roller coaster glucose levels can lead to obesity. When the body releases insulin to mop up excess sugar in the bloodstream, blood sugar plunges. This fast drop increases appetite in an effort to bring blood sugar levels back up. After eating, the body releases even more insulin to get rid of extra glucose, and over time, this cycle of high and low blood sugar levels can impact metabolism, according to Loren Greene, an endocrinologist and obesity expert at New York University’s Langone Medical Center. “People who are very stressed and studying for an exam might be up more hours to munch,” says Greene. The lack of sleep that often accompanies being overworked can also change the body’s normal secretion of hormones, she says, increasing hunger and leading to cravings. This new study explains the inclination to eat more when completing mentally difficult tasks and hopefully will give employees even more reason to exercise, according to Chaput. “[Mental work] deserves to be counterbalanced by an adequate physical activity regimen,” he says. So if night after night you’ve been up until the sun rises studying for exams and your pants seem tighter, you may have your brain to blame. How can memories of food lead to weight loss? Is probiotic yogurt a healthy choice? for once i now understand the relationship between glucose, insulin and obesity. but why haven’t medicine and pschiatry/psychoanalysis found a perfect balance between ‘skinny’ and obesity without the exertions in a gym. healthcare must invent a way to make central obesity healthy. that will be it’s test. after all the health administrators and insurance and doctors have been stealing suffering public’s money for over a century. it’s time for a breakthrough. innit? thanks for correlating blood levels, insulin and obesity in this great article, allison. always asked myself that. as a med student in my first year it was really interesting. thx! Darn, i was hopping it did. but this cleared up why i feel hungry after reading. That’s very interesting. I too have noticed how I tend to feel more hungry after either reading or writing and I do both of those activities on my computer. After performing a BMR calculation (yes, I know, not the most scientific thing in the world) I was hoping that my sedentary but thoughtful lifestyle might offer me some hope. Ah well! Looks like I’ll have to go for a walk more often. This doesn’t sound like very strenuous concentration. When I was a mathematics major in college, I would sometimes concentrate so hard “steam” would literally come off of the top of my head. That heat has to come from somewhere. I agree with matteo. The study clearly showed a drop in glucose on the part of the KBW activity and attributed the observation (ie: Knowledge work leads to fluctuations in glucose level due to brain activity) as an obesity risk. Comprehension is a required skill when dealing with the language of Science. Skepticism is a required life skill when dealing with web posts. Do not trust and always verify. @matteo, the post is by no means false. The abstract clearly states that energy intake (i.e., calories consumed) were significantly higher in the two working groups compared to resting controls. ‘Energy intake’ refers to calories consumed, not calories burnt, as you supposedly misunderstood. There was a significant difference in appetites, again ‘no specific dietary preference’ is very, very, different from “having the same appetite!!!!!”. I would go into more details, but I shall stop here simply because I don’t even know where to begin to explain things to you. Check whether you know how to read scientific articles first, before posting inane comments. And do away with the multiple exclamation marks, might make you look less inane the next time around. I am wondering why Cognitive Load theory isn’t considered? Perhaps they just are more as kind of rewarding themselves?